Photo by Photo by Callie Miller. These are concept sketches for each character’s costume. Note the word “concept”; the images you see here may have little to no bearing on what you will actually see on stage. 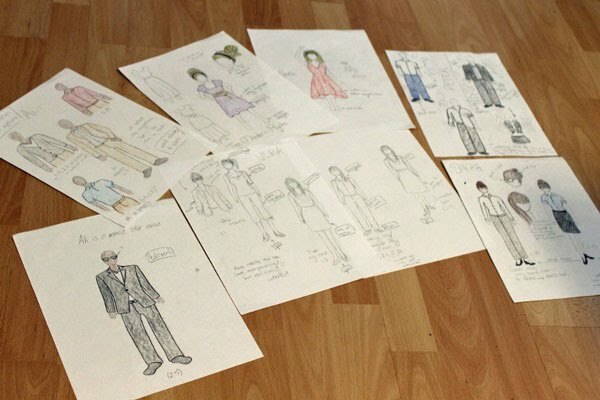 The sketches are used as a jumping-off point for design conversations between the director and the costumer, and so pictures such as that of the pink dress above are meant to represent not “a dress with this exact cut”, but “a dress with a refined cut that could be seen as fashionable over multiple generations”. A pair of jeans, however, usually represents a pair of jeans. Changes often occur in the process of converting pictures on paper to actual clothing. Sometimes it turns out that you can’t find that nice jacket you designed because Davis summers are so blindingly hot that all the coats go into hiding. Or, sometimes an actor happens to show up to rehearsal wearing a dress that you’ve never imagined before, but now that you see it you realize it’s perfect for their character. And sometimes you get so fed up with searching thrift stores and your friends’ closets for the perfect scarf that you just go to the fabric store and make it yourself. The genesis of actual costume pieces is set to begin tomorrow, so stay tuned for more photos of the evolutionary process! Alix Miller is Costume Designer for Psyche, and is co-Costume Designer (with Anna Eckert-Kramer) for Or,.